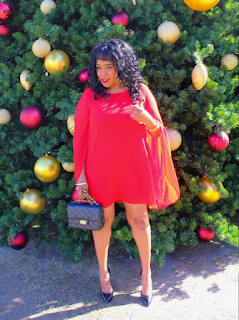 The Fab Five Fashionista's: The Christmas Edition! Happy Monday Babes! This late night blog post is finally here because, well life has been hectic the last week or so! And, with Christmas around the corner, well, let's just say, the race is on! This collaboration with my girlfriend's and fashion sisters is our Christmas Edition! 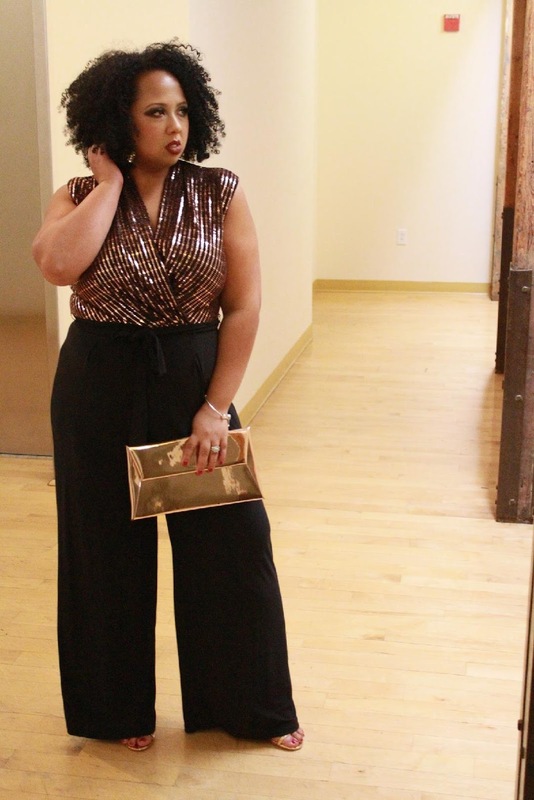 We give you five different looks you can get ideas on for that perfect holiday outfit! 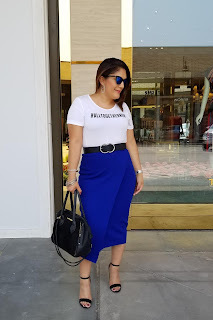 What I loved about this collaboration is that even though we all love most of the same stores, but we all brought totally different looks for you to get ideas from! 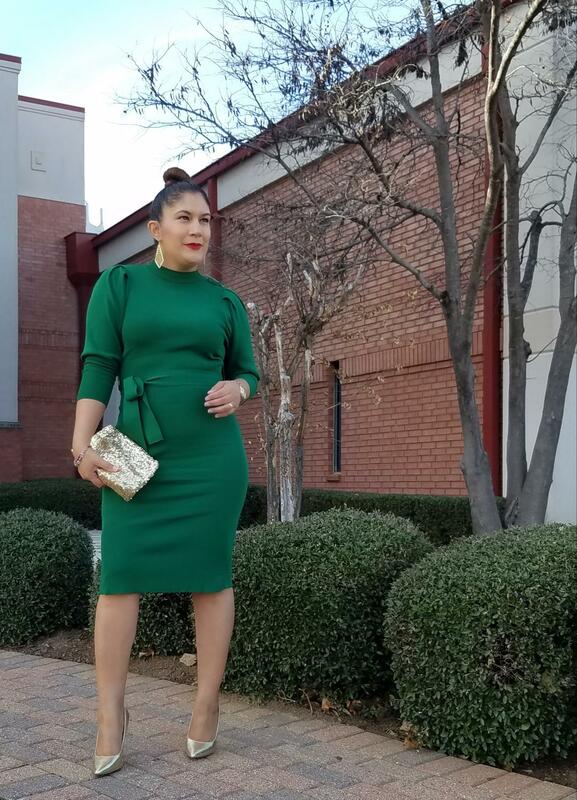 Whether you are going to a fancy Christmas party, office party, or just hanging with your family, we have holiday outfit ideas for you! 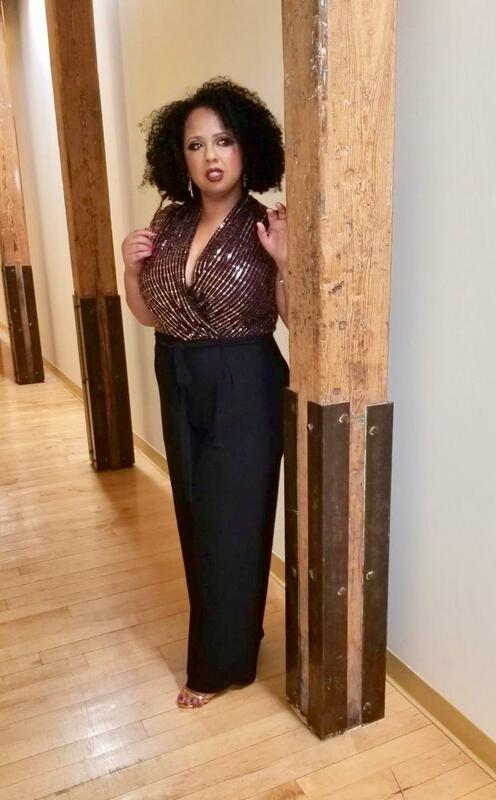 I have glam and casual looks for you! 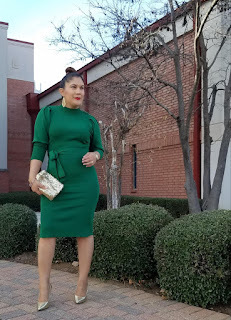 The first is an Eva Mendes emerald green dress from New York and Company! I paired it with gold accessories for that glam feel! 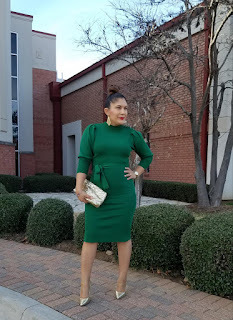 The sequins mini clutch and gold pumps are resale shop finds at my local Plato's closet (mixing new with old)! The second look is casual yet chic and is perfect for that office party or time with family at home! 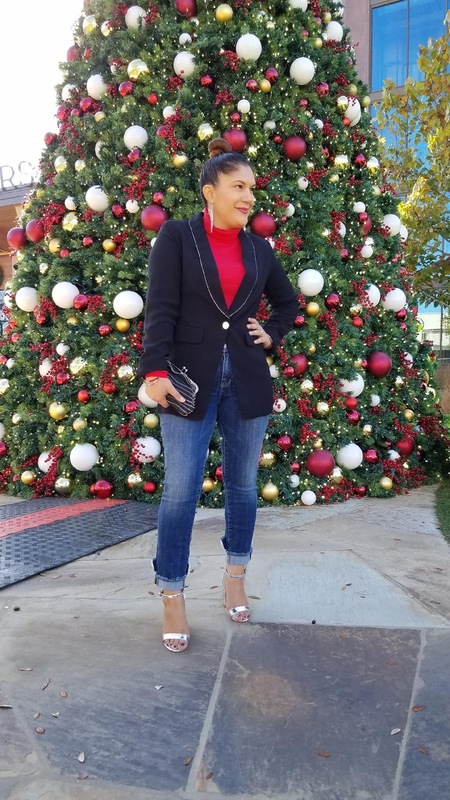 The blazer is Jennifer Lopez from Kohls, the jeans are Rock & Republic also from Kohls, and the red Apt9 turtleneck is also from Kohls (Linking all below)! 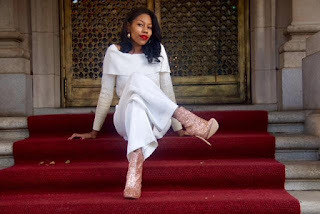 Reyni "CurlsandHighHeels" brought GLAM to this holiday Christmas outfit idea! I love her make-up and her complete look, she rocked it, and is ready for that fancy Christmas party! 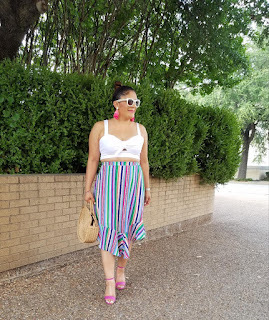 Be sure to follow her blog and social media accounts for outfit details! Ayesha "EmaneesCloset" is giving us Christmas vibes with this all white look and a splash of sequins boots! Her look is simply fresh and glamorous! Like beautiful snow flakes! 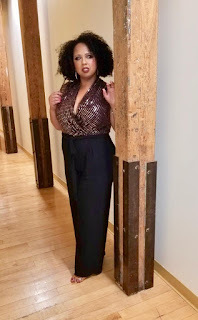 Her look is from New York and Company and Just Fab! She has all the outfit details on her social media platforms as well! Check her out! 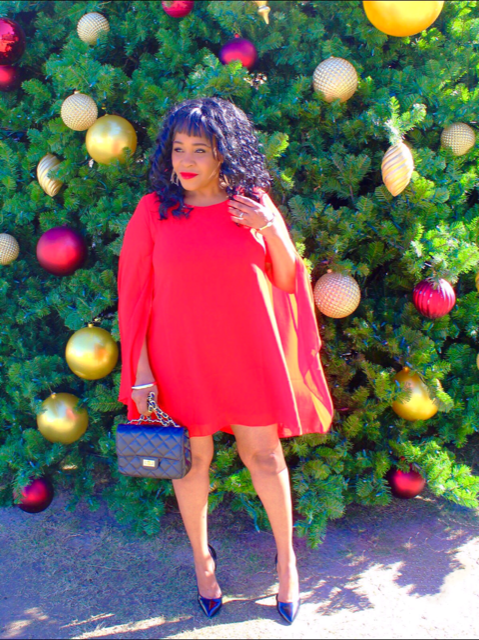 Yolanda "CurlyPetiteRenee" is looking fabulous in this red cape shoulder mini! She adds a black bag and classic black pumps for that complete glam look! She also has accessories from Just Fab online! She can be followed on Instagram and her blog for all the details to this gorgeous Christmas inspired look! 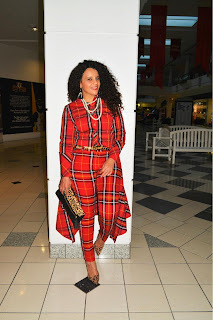 Mary "CurlyByrdie" is mad for plaid! 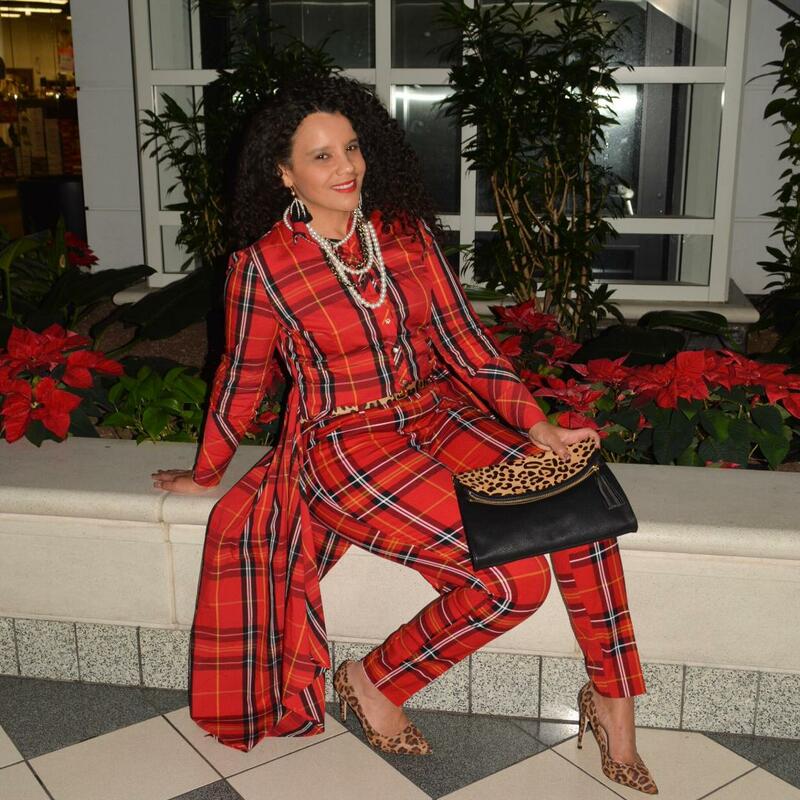 She is rocking plaid on plaid for a gorgeous holiday look! She shopped her look at New York and Company, Gordmans, and Goodwill! 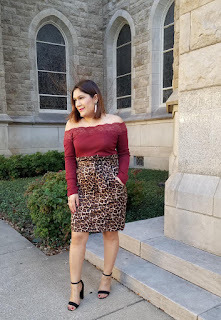 I just love the leopard print details! 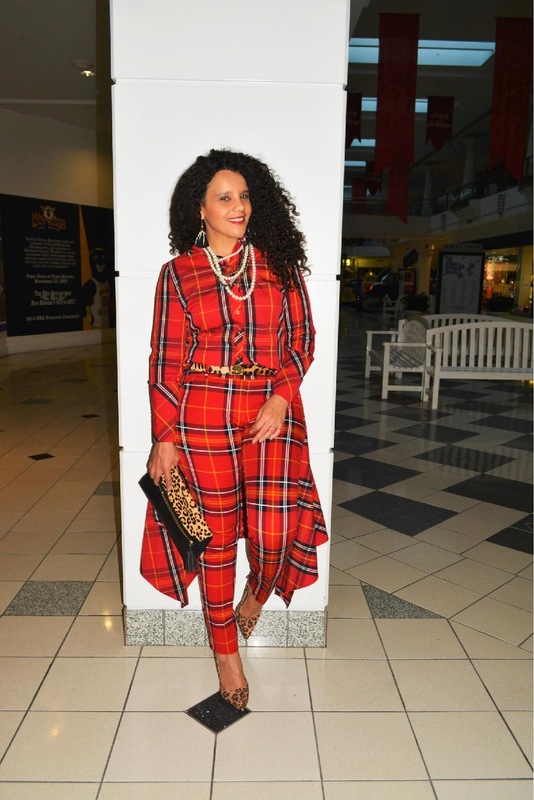 Pattern mixing is one of my favorites and Mary is definitely giving us those vibes! And so, here are some amazing glam holiday looks to give you some ideas on what to pair together, where to shop, and how to style that holiday outfit! The amazing women and I love bringing our styles together to fuse amazing fashion inspiration! Be sure to check them out on Instagram, Twitter, Like To Know It, and their blogs linked in their IG profile! Happy shopping loves and as always, thanks for stopping by and reading my feed! I am truly grateful for the beauties and for all the collaborations we have started and to many more in 2019!